Performance as part of the exhibition "Unitasking (tentatively)"
"Paraperformance 2" is the second part of a trilogy that began in 2014. The prefix "para" refers to the alongside- and beyond- existing, pointing to the parallels between the magical and the scientific, the factual and the fictional. In "Paraperformance 1", the spatial distance of the artists allowed only a few moments of encounter. Consequently, telepathy became their means of exchange. The resulting video work confronted the performative acts and questioned their possibilities of cooperation. In the second part Hellmich and Wüst communicate vis-à-vis through the juxtaposition of acts, video recordings, texts, pictures and quotes. In this way, the success of the telephatic process will be examined. The resulting visible dialogue links the experienced elements together which were once isolated: "There are lists of characters, not more, even those who know them all can always only argue from each individual separately on something separate in the future." (Canetti: Crowds and Power, 1960). 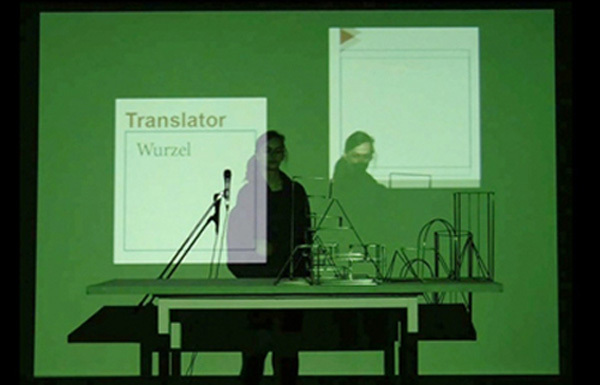 Since 2008, Helene Hellmich and Veronica Wüst are working together at performances, videos, booklets (börne & worst) and exhibition projects.